When I started doing the Friday NI Rocks Show on Rock Radio NI back in 2010 local band Million Dollar Reload were featured regularly and “Tattoos and Dirty Girls” appeared on the very first show. They continued to be included fairly regularly even after the farewell performance by the band in 2015 – in fact they were second on the list of most played bands by the time I reached 400 Shows in August and four of their tracks appeared in the top 25 most played songs. Just before Million Dollar Reload performed for the last time on 15th August 2015 I recorded an interview with singer Phil Conalane which you’ll find here – http://www.rockradioni.co.uk/interviews/2161-ni-rocks-interview-with-phil-from-blackwater-conspiracy-million-dollar-reload.html - The band re-emerged as Blackwater Conspiracy, releasing their debut EP that same night. The latest interview has been transcribed and posted below. NI ROCKS – Hi Phil, thanks for taking some time to talk to Rock Radio NI. 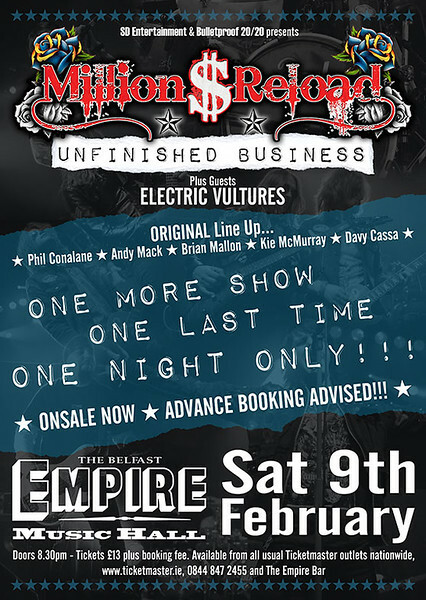 I was wanting to talk later about the upcoming Blackwater Conspiracy album, but first of all lets talk about the Million Dollar Reload reunion show in The Empire in Belfast on 9th February. Is that something that had been talked about for a while and what made the time right for a one-off reunion show now? PHIL – It’s kind of a strange one. As you know the band broke up when Andy left and he’s been out of the band for quite a few years. And Davy has been out of the band for almost eight years. The band have continued on in various guises, but Brian and Kieran and I were there for the whole duration. Other members changed, but the chemistry was never the same. Even though it changed and it was still great, it was never the same after Andy and Davy left. We all parted on relatively bad terms; we fell out and we didn’t speak. Then we reconnected again with Andy a couple of years ago, just out of friendship; we never really talked about music or putting Million Dollar together or anything like that at all. Then, out of the blue, we found ourselves at a table with Davy as well and we were chatting, shooting the breeze and telling a lot of stories about being on tour etc. Basically, catching up with old friends, and then the idea was just there. We never really had that final show with the original line-up, the proper Million Dollar Reload and we thought about it for a while and decided it would be really cool if we could do one last show for ourselves and for the people who got into Million Dollar Reload in the beginning. We talked about for it a little while and then decided let’s go for it! Let’s see if anyone is interested! I put a few feelers out for a couple of months and videos and different bits and there seemed to be a bit of an appetite. Then we got the Empire show and just decided to go for it. Within a few hours of the tickets going on sale it went completely bananas and we’ve been pretty pleased with the response so far. NI ROCKS – As you mentioned, yourself, Brian and Kie have reunited with Davy and Andy to reform the original line-up. How difficult was that on a personal level and also professionally - to gel together again as a band? Did that come easily? PHIL – On a personal level and friendship level it was extremely difficult to work through that. Not to work through that, but to let bygones be bygones. It is ten years later and we’re a little bit older and a little bit wiser, so we don’t really hold grudges as much anymore. Once we got the friendship thing back to where it should be, the production and the music thing was a no brainer, easy decision. Once we got the friendship back, the music was easy to follow up. The thing is that everyone is in different projects; Andy is doing his own thing, he’s involved in other musical ventures, as is Davy. Then Brian and Kie and myself are Blackwater, which takes up a lot of time. So we’ve basically had to find a window where the five of us could have that bit of time; because obviously we’ve rehearsals and putting things in motion. It took a little bit of time to get that all worked out and figured out, but once we got the friendship sorted out, the music was easy. But even if we just got the friendship sorted out, putting Million Dollar back together was never really the priority. We kinda grew up together and done a lot of things together and it was more important to get that all settled and get our friends back together, rather than the band, just to be honest about it. NI ROCKS - The line-up for the gig in February is that which recorded and released the debut album “Anthems of a Degeneration” back in 2007. What are your memories of recording that first album? PHIL – Well, Davy recorded “Anthems of a Degeneration”, but he was also fully involved in the process for “A Sinner’s Saint”. There were only maybe one or two songs that Davy hadn’t a little bit of involvement in, but Davy left...or was fired or sacked or left Million Dollar (laughs)...whatever way you want it! The memory is quite blurred, but we could say Davy decided it wasn’t for him anymore; but up to that point Davy was already in the studio with us for “A Sinner’s Saint”, so he might as well have been on it. He was there for the writing process so he was involved probably with all the songs. The recording process with “Anthems” was kind of a new thing; this was in 2005 / 2006 or whatever and it was our first experience of recording in that kind of environment at Neal Calderwood’s Manor Park Studio. It was a different situation than any of us were used to as far as a recording process goes. It was all a learning curve, but it’s something that we feel we’ve taken with us down through the years, from that first recording session with Neal Calderwood, we’ve taken it with us to different studios all over the UK. We learned a lot and recording “Anthems” was enjoyable. No doubt about it, it was definitely an enjoyable experience. NI ROCKS – “A Sinner’s Saint” was released in 2012 and you mentioned Davy was involved in the writing of that, but presumably he hasn’t played any of those tracks live before, so it’ll be a first time for those? PHIL – No, he hasn’t played any of those tracks live yet, but we’ve had a few rehearsals and he knows the songs inside out. To give Davy fair credit where it’s due, he has really knuckled down and learnt those songs straight off the tape. We put the set together and he went away and a week or two later he had the songs nailed. He came into rehearsals and nailed them straight away, with that extra bit of groove; not that we missed, but Davy brings a particular groove to his drumming. He brought that in and the songs took on another life and another bit of chemistry from what they were. Sean was the original drummer on “A Sinner’s Saint” and then Fionnbharr came in for the live situation, so Davy brings an extra bit as well and it’s brilliant to have that. NI ROCKS – That second album was released through Frontiers and you didn’t have a great experience or relationship with Frontiers. Has that experience influenced how you’re taking forward Blackwater Conspiracy? PHIL – Yeah, absolutely. A record label comes along and puts a bag of cash on the table and you think this is great; you’re landed! But you soon learn that just because they’ve given you the money up-front it doesn’t really mean anything in the grand scheme of things. They didn’t work the album, it just died on it’s feet. It was a really bad experience with Frontiers as far as we’re concerned. I’ve nothing positive to say about them whatsoever on any level (laughs). It is what it is, But, did we learn anything from that? Absolutely. That’s why, at the moment, we don’t deal with record labels when it comes to Blackwater Conspiracy. We just don’t! NI ROCKS – I think I know the answer to this question but I’m going to ask anyway. Any big surprises planned for 9th February? PHIL – Other than playing a shed-load of songs no-one has heard in a long time? (laughs). Everybody is coming with expectations. The funny thing is that I can pretty much guarantee that 50% of the audience that are going to be there have never seen Million Dollar, because we have found out through Ticketmaster that most of the tickets have been sold in England. Three hundred tickets have been sold so far through Ticketmaster and I think 130 have been sold in the UK, two have been sold in Germany, three have been sold in Brazil and two have been sold in Australia, so work that out! NI ROCKS – We bought ours in Tenerife, does that count! I was sitting by the pool when I bought mine! PHIL – At least you got the tickets, that’s the main thing! NI ROCKS – We kicked off with Tattoos and Dirty Girls from the Anthems album – no surprise there really! We’ll play another track from that album now. Which one would you like to play and why? PHIL – “Livin In The City”, because it was our first single and we went to London to shoot our first video for that song. It was a good song and it has stood us well. We mixed a little bit of live footage in from the Rosetta bar in Belfast. NI ROCKS – Our last interview was recorded in The Empire in August 2015, the night that you launched Blackwater Conspiracy. That was my 50th time seeing Million Dollar Reload perform and I thought it was going to be the last until now. It’s appropriate really then that The Empire is the venue for the one off reunion. Was it chosen for that reason? PHIL – The Empire was chosen for a number of reasons. The Million Dollar Reload reunion was offered to us for a couple of different venues, but we all decided that it was either The Empire, or it didn’t happen. The reason why was that The Empire kinda became our spiritual home near the end. If the Rosetta had still been going, then the reunion show would have been there, but it’s not around anymore. The Empire became the spiritual home for Million Dollar and that’s the reason it was The Empire or nowhere. We wanted it on a Saturday night; you know we’re all a little bit older now and some of us can’t do Friday night gigs...or Sunday night gigs (laughs). It had to be a Saturday night and it had to be The Empire. It all lined up really well and we were able to get The Empire, so we’re happy where it is going to be. NI ROCKS - I know the answer, but I have to ask. There won’t be any more “one-off re-union shows” then – it’ll not be like Kiss’s “farewell” tour! PHIL – No, this is definitely it. We’ve got so much else going on. Davy has other stuff going on, Andy has other stuff going on and we’ve got Blackwater with a new album coming out very soon and we have to work that. It’s maybe not a case of we wouldn’t want to, but we’re just not going to have the time to do it. This is the best way to do it – the original five for one more night and that’s it. NI ROCKS – You mentioned the new Blackwater Conspiracy album. You’ve been in the studio recording the second album. Who have you been working with and when do you think that the album will be released? PHIL – We’ve been working with the same guy that we worked with on the first Blackwater album “Shootin The Breeze” – same guy, same studio. The only difference this time is that we didn’t go to Rockfields to do a little bit of tracking, we just did it all at home, here in Northern Ireland. It’s all recorded and pretty much all mixed, so we’re just gonna talk to management, to distribution and get the right release schedule. I imagine it’ll be spring time – late or middle spring – to tie in with festival season and the touring. NI ROCKS – Is there going to be any big change to the Blackwater Conspiracy sound on the new album, or is it very much as you were? PHIL – Oh, there is definitely a few changes in there. We’re not going to give it away, but there are a few changes. A few changes and a few additions – what about that? NI ROCKS – Ok! You mentioned festivals. What plans do you have to support the release of the album, both locally and further afield? PHIL – At the moment we have no plans for Northern Ireland at all, but over in England we have a few festivals lined up and a few tours lined up. We’ve nothing planned at home simply because of availability. The venues at home aren’t really that available for when we want to do it, so we’ll probably have to wait until we get back home again. NI ROCKS – It’s been almost three and a half years since the launch of Blackwater Conspiracy and the release of the debut EP. The second album is on its way. Is that the kinda timescale you anticipated or did you think things would have moved quicker? PHIL – No, two and a half or three years is basically the kinda progress or time schedule that we worked to (laughs), between albums and releases. It’s not really surprising; you have to bear in mind that it was five years between Million Dollar albums. We’re getting better – two years between the two Blackwater albums. NI ROCKS – Although you released the first Million Dollar album several times! NI ROCKS – We’ll play a track from the first Blackwater Conspiracy album now. Which one shall we play and why? PHIL – “Monday Club”, because that’s the one that got us on the radio and took us to a different level; over in the UK anyway. NI ROCKS – The new Blackwater Conspiracy album will be one of several much anticipated releases from local bands this year – we’re also expecting a Screaming Eagles album and Gasoline Outlaws at some stage, and probably a lot more. How do you think the local rock music scene here compares to the rest of the UK? PHIL – It’s not too bad. There are a lot of good bands at home here in Northern Ireland, but the problem is there are enough venues. Because Northern Ireland is so small, you can pretty much travel anywhere within an hour, whereas in the UK it’s completely different. That’s why Screaming Eagles, Trucker (Diablo), Gasoline (Outlaws), Baleful Creed and ourselves have to go to England, Scotland and Wales to play the shows that we want to play. There aren’t that many venues left at home anymore, as you know yourself. Venues are closing down and getting turned into apartment blocks or whatever. That, realistically, is the problem. The appetite is still here and there are still good audiences; and there is the odd venue here and there that pops up every now and again, but for the most part at the moment the ‘scene’ and the bands are here, but the venues for them are certainly not. NI ROCKS – Musically, what do you find yourself listening to these days? What was the last album you bought for example? PHIL – The last album that I bought...you’re not going to believe this.. (laughs)..was Slayer – a live album, “Decade of Aggression”, which I bought about a week ago and I’m listening to that at the moment. But, it changes from day to day. I still like my straight up rock – Aerosmith, AC/DC and the usual – but I like to listen to Blackberry Smoke, Rival Sons and stuff like that. I’m really into the Kris Barras album at the moment too. He’s a good friend of ours and I like his stuff. A bit of everything really. NI ROCKS – The second Blackwater Conspiracy album is a work in progress and should be out soon. The second Million Dollar Reload album was “A Sinner’s Saint” in 2012. How did working on that album compare to the debut and is with hindsight is there anything that you would have done differently? PHIL – No, I don’t think I would change anything. To be perfectly honest I don’t think I’d change anything about any of the recording processes, because each time was a learning process. We learnt something each time and each was an evolution. We took something from the first Million Dollar album and the second Million Dollar album. We recorded them both in the same place, but with slightly different techniques and more knowledge of the recording process. Then we took those experiences forward into the Blackwater recording process. We went to Wales and recorded there and took it back and did it at home. We took all the experiences of recording, the knowledge and everything we learnt into the new Blackwater album. So I wouldn’t change anything as such. It is what it is. NI ROCKS – Million Dollar Reload went on to record the live album “As Real As It Gets”. Would you ever consider doing a live album with Blackwater Conspiracy? PHIL – Not right now, no. We have some live recordings of Blackwater, but not done in the situation that “As Real As It Gets” was done. I don’t envisage Blackwater doing anything like that in the immediate future to be honest. NI ROCKS – Not even as an EP or something? PHIL – No, I don’t think so. Blackwater is a different animal as opposed to what Million Dollar was. Million Dollar was ferocious, balls to the wall, non-stop aggression rock; whereas Blackwater is a lot more laid back and considered. I don’t think a live album at this point would be the way to go; or likely to be for that matter. But, never say never! NI ROCKS – That’s all the questions that I have, but we’ll finish by playing a couple more tracks. One from “A Sinner’s Saint” and one from “As Real As It Gets”. I’ll let you pick. PHIL – Go with “Bullets In The Sky” from “A Sinner’s Saint”, because it was the biggest song we ever had as Million Dollar and from “As Real As It Gets”, “The Last Icon” because that a great song and I’m looking forward to singing that song one more time too.